Why is primary education so high on the political agenda, and so contentious? Why is the performance of primary schools so often in the media spotlight? Why should primary teachers trouble themselves with the politics of their work? 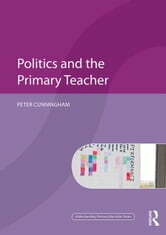 Politics and the Primary Teacher is an accessible introduction to some of the thorniest aspects of a primary teacher’s role. It aims to support your understanding of the constant changes in education policy, give you confidence to engage critically with current political debates, and consider how you might shape your response accordingly. education for citizenship, health and well-being. Politics and the Primary Teacher is essential reading for all education professionals who want to think more deeply about primary education, what it offers, and how children, families and communities are served by the primary school.